If you are reading this then you have come to the right place! 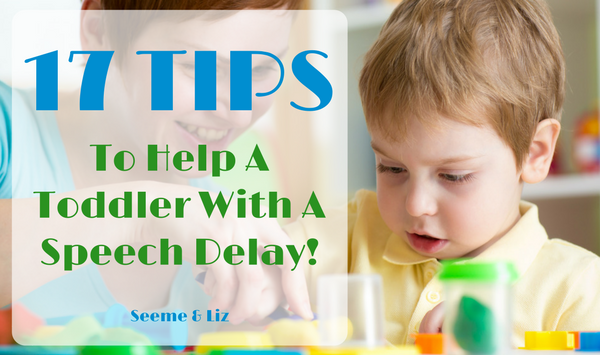 I am going to share with you 17 tips to help a toddler with a speech delay. For the purpose of this article, a toddler refers to children between the ages of 18 and 30 months (give or take a few months). However, many of these tips will work for other age groups as well. 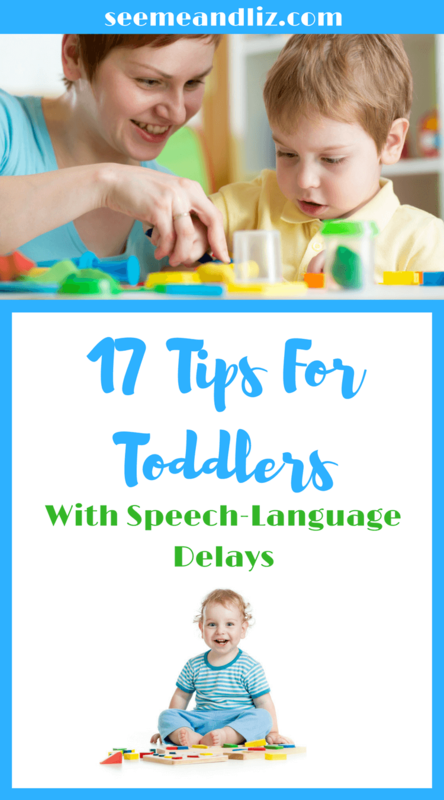 Before I get into the tips I want to make sure you understand the difference between speech and language, as many people will say “my toddler has a speech delay” when they actually are referring to a language delay. Speech development refers to the production of specific speech sounds. Most children will learn the sounds /p/, /b/, /m/, /n/, /h/ and /w/ first, along with some basic vowel sounds. social skills such as turn taking, eye contact, etc. As I said, this is a basic overview to show you the differences between speech and language development. The tips I am about to share with you will be for both speech and language! Make sure you have some time set aside to get through the entire list! 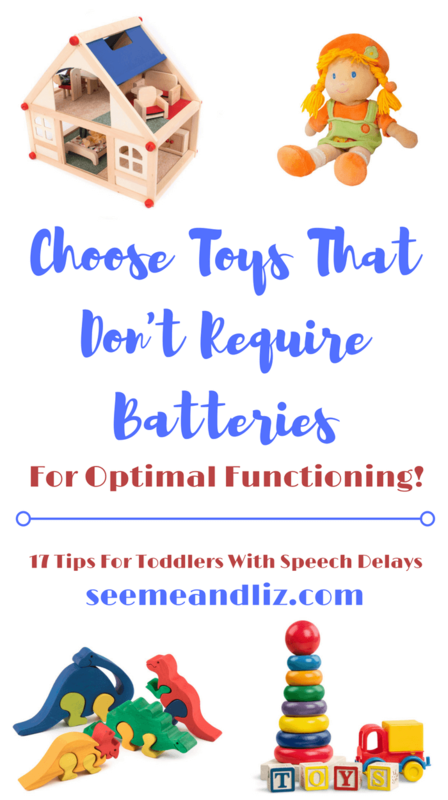 If you feel (or have been told) that your toddler’s speech and language development is not where it should be for his/her age give these tips a try. Since this list is quite lengthy and can be difficult to remember, be sure to download the PDF version! This is a great way to make sure grandparents, aunts, uncles and caregivers have access to the same information you do. Even if you think that your toddler can hear everything, his hearing may not be 100%. The cause of a mild to moderate hearing loss in toddlers is usually due to ear infections. Since any language a young child is hearing is new to them, they don’t know what to expect. So they must hear everything clearly if they are going to use and understand that language. Something as simple as fluid in a child’s ears can affect their hearing. Imagine yourself underwater and hearing a language that you are not familiar with. This is what it can sound like to a child with a hearing loss as a result of middle ear fluid. If your child has a history of ear infections, you can make an appointment with an audiologist to have your toddler’s hearing checked. If you ever feel like your child is delayed in any area of development seek professional help. The earlier the better! A child’s early years (birth to 3) are a crucial time in their development. Please do not take on a “wait and see” approach when it comes to your child. You are not a bad parent because your child is not developing as per expectations. And you will be a great parent by seeking help for your child. 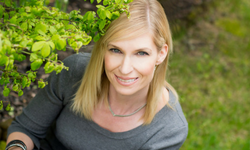 To find a licensed Speech-Language Pathologist within North America, please click on the Resources tab. In North America Speech-Language services are often publicly funded for children under the age of 3! You can also get started with the It Takes Two To Talk book, written by Speech-Language Pathologist Elaine Weitzman. This book has so much actionable information for parents! Please do not be discouraged by the price tag! I recommended this book to every parent I saw in my practice who had a young child with a speech delay. Think about yourself learning a new language. If the people you are in regular contact with are speaking quickly, never repeating themselves you would have a hard time learning that language. The same goes for your toddler. This is especially true if your child is learning more than one language. 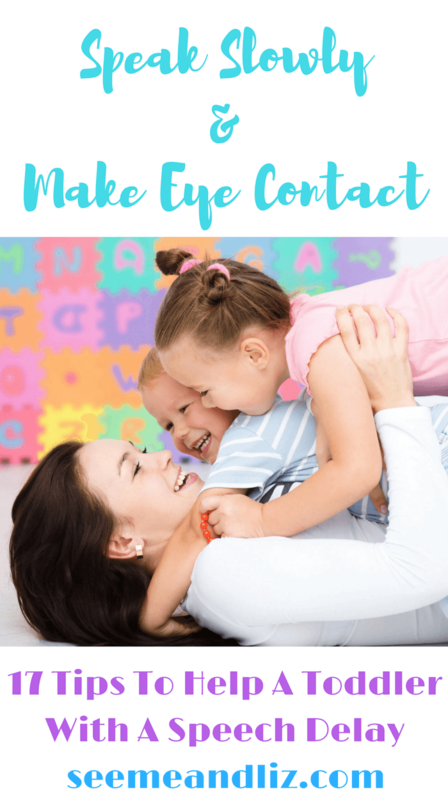 If you notice your toddler has tuned you out, or seems to be ignoring you, it could be because you are simply going to fast and he can’t keep up (or it could relate to Tip 1). Slow down when you are speaking directly to your child! You don’t need to sound like you are in slow motion, but take your time when speaking. This doesn’t mean you should use baby talk though. Make sure you are looking at your child when you are speaking to them. Children can gain a lot by looking at your mouth while you are speaking. Making eye contact is also an essential part of communication (in most cultures). It is a foundation skill that comes naturally to most children. As I mentioned above, the first sounds typically made by a baby/toddler are /p/, /b/, /m/, /n/, /h/ and /w/. If your child is struggling with these early sounds make sure you are pronouncing them very clearly. And from time to time, over pronounce them. For example, if you are blowing bubbles for your child really enunciate the “p” in “pop”. You can even point to your mouth to draw your child’s attention to the movement of your lips while you are saying “pop”. The same goes for “bubble”. This can be a tricky one for many parents. I have seen it happen many times. A child will say a word, for example “bud” (for “bubble”) and the parent will say something like “oh you mean bubble, say bubble, I know you can, say bubble.” This will result in your toddler becoming very frustrated and tuning out. It’s ok for you to repeat the word, but drop the expectation of having her repeat you. While you may think she should be capable of saying the word correctly, she probably isn’t. A toddler is not developmentally ready to pronounce every sound and word correctly. Pronunciation, or articulation involves many muscles and fine motor skills that a toddler has not developed yet. This one is pretty much a summary of tips 3,4,5 and 6. If you are following all of these tips, then you are being a good speech and language model! And this leads us into tip 8. You will feel like a broken record, but your child needs the repetition. Children need to hear words 100’s, probably 1000’s of times before they begin using the word themselves in a meaningful way (not just repeating you or only using it in certain situations). Let’s go back to the bubbles activity. Narrate what you are doing. For example, you could say “look at the bubble, do you see the bubble? The bubble is floating away. Uh oh, the bubble popped. Let’s blow another bubble“. In the 2-3 seconds it took you to say those phrases, you have said the word “bubble” 5 times! Your child will gain more from your interactions with him if you are down at his level. This means getting down on the floor and playing. I know this can be hard for some parents. I will admit that despite my background and having worked with children before having my own, this was one of the hardest things for me to do. It just didn’t feel natural to me. I would have much preferred to sit on a chair and “observe” my children. However, I know the importance of “getting down to their level” that I made myself do this. It does get easier and the reward of seeing your child’s smiling face makes it worth the effort. So let your inner child out! This section can be an article of its own! Toys with batteries can get quite annoying. 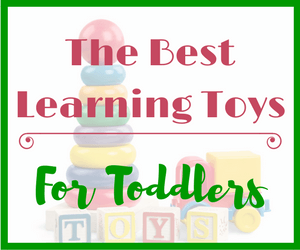 And for toddlers, the sounds that these toys make will not enhance their learning. Some toy manufacturers claim that their toy will teach a child “letters, numbers, colors, etc”, but I have to disagree and many others would support this idea. The whole goal is to get your toddler vocal and verbalizing. If the toy is doing all of the “talking” the child can sit back and listen. Also, most children are more likely to imitate a person over an electronic toy. Another thing I would like to point out is that you should not be trying to teach your baby or toddler academic skills (don’t even get me started on the “your baby can read” program – luckily the company seems to have gone out of business). There is plenty of time for a toddler to learn academic skills. Language skills are a greater indicator of success later on in school than is the fact that your 2 year old can recite their ABC’s. Now, all of that being said, I will contradict myself a bit. 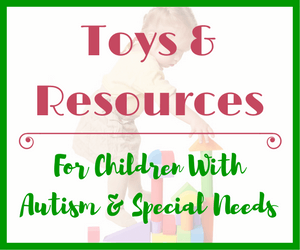 Don’t feel like you cannot have any toys with batteries. Some toys need batteries for basic functioning. My son had a pretty cool ball drop toy that he engaged with more when the batteries were in it. It came with 3 clear balls that had little animal figures inside (so of course I always told him the animal names and the sounds they made and said the word “ball” many, many times). He could drop the ball into the trees that were part of the toy and watch them come out and then be spun around. The music it played was a bit irritating, but the spinners didn’t work without batteries. I love open ended toys such as play kitchens, play houses, dolls, blocks, etc. 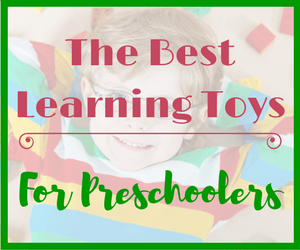 There are many more opportunities to develop language skills with these types of toys! If your toddler is starting to use some single words, expand on what she said and add more language. For example, if your child brings you a toy truck and says “truck” you could respond with “yes, it’s a big truck”, placing the emphasis on “big truck”. You could then add even more language around the word “truck”. “The truck has wheels” or “The truck is red”, etc. Or if your child drops something and says “uh oh”, respond and say “uh oh, your cup fell down, let’s pick up your cup“. Try not to dominate your child’s playtime. Take a step back and watch what your toddler is doing and then wait some more. Listen to see if he is saying anything to himself. Or if he isn’t using any words, perhaps he is gesturing or looking intently at something. By taking a step back you can find many new opportunities to communicate with your child! Your child may be interested in things that aren’t of much interest to you. You may try to steer her towards a toy you feel she should be playing with, or an activity you believe would be better for her. If your toddler expresses an interest in something and you follow her lead, she will be much more interested in interacting with you. 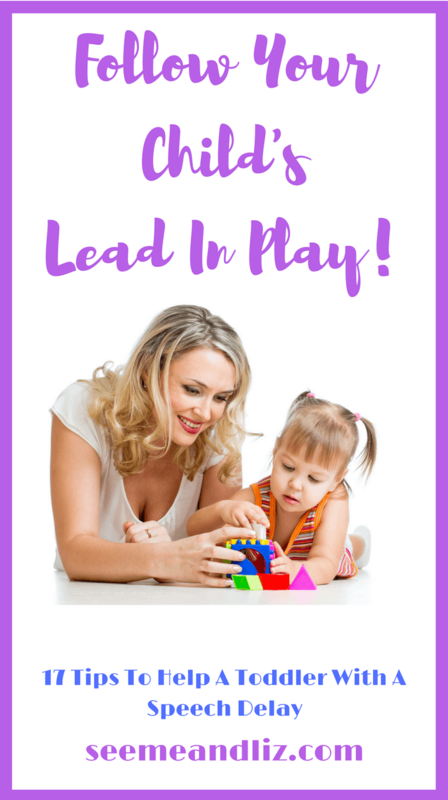 You can let your child lead by imitating what she is doing, commenting on what she is doing, repeating things she has said (and expanding), etc. If you are interested in something, chances are you will be more engaged than if you are doing something that you aren’t interested in. The same goes for a child. If the child is always redirected and doesn’t have the opportunity to do what she would like to do, she will disengage and the language learning opportunities will be lessened. As I mentioned in Tip 10, many toy manufacturers are using the fact that their toy teaches “academic skills” as a selling feature. Please do not listen to this. A toddler does not need to work on academic skills. What they do need to work on is developing play skills. Play skills build the foundation for academic skills later on! Read to your child daily! Find simple yet engaging books. But stay away from e-books for children of this age group. While an e-book on a phone/tablet may be engaging because of the ability to touch an item on the screen and watch something happen (cause and effect), studies have shown that children do not engage with this type of book the same way that they do with a physical book. Children do not retain what they heard to the same extent that they do with a physical book. Cause and effect books do exist as physical books! These are usually “lift the flap” books or “pop-up” books. Looking at a physical book (holding it, pointing to pictures – without something happening, turning the pages) all help with pre-literacy skills and print awareness. When looking at books with your child, you do not always have to read the story word for word. Make it up as you go! Let your child point to items in the book and then pause and wait. Listen; your child may say or sign something. If the book you are reading is a repetitive book such as the classic “Brown Bear Brown Bear” by Bill Martin/Eric Carle and your child has heard it several times, pause to see if your child will fill in the blanks. Ask your child questions to keep the conversation going, but don’t ask too many. You don’t want to come across as a drill sergeant. Ask simple questions such as “where is the ball?” (assuming the child can see it) or “what is on your foot?” This will help with a child’s understanding of language and reinforces vocabulary words. However, don’t “test” your child. This will end up causing a lot of frustration and perhaps even some temper tantrums. Some routines you may be familiar with such as peek-a-boo. A routine basically has certain steps that follow an order and can be repeated many times. Children learn from these routines because of the repetition and if the routine is a people game such as “peek-a-boo” it is also quite fun for the child. You can also make up your own routine if there is something your child is interested in. My children loved the “fall down” routine we made up. I would have them sit on my lap and move my legs up and down while saying “bump, bump, bump”, then I would pause and say “uh oh you fell down” and slightly open my legs allowing them to “fall” (while still holding my child of course). This always ended up in laughter and them telling me they wanted more of this activity. Songs and finger plays are also a great way to help with language development. Nursery rhymes also fall into this category. An example of a finger play would be “this little piggy”. A song that my daughter was fascinated with that we turned into a routine was “row row row your boat”. She sat facing me holding my hands. I would gently pull her back and forth towards me while singing. At the end when we got to “life is but a dream” I would slowly let go so that she would end up laying down. She thought it was the greatest thing ever! Toddlers also love finger puppets that you can incorporate into finger plays! The puppets allow for further vocabulary development and can be used later on for story telling as well. I hope that these tips will help you and your child! Please leave me a comment and let me know if you are using any of these tips with your child. If you made it all the way to the end, don’t forget to download the PDF version so you can refer to this list anytime you want! We thought we were doing our daughter justice by introducing two languages at the same time but am wondering if that is the leading cause to her potential speech/language delay. She just turned two and only has about 15-18 words. Many of her words are animal sounds… Moo, quack quack, woof woof, meow, etc. her understanding and all other milestones are on point. Her pediatrician is referring us for a speech evaluation. Wondering what may be the potential cause? I have to note that she gestures and signs a lot for what she wants… but isn’t vocalizing. I have to say I am the type of person that worries, stresses and definitely jumps to conclusions. Like is she ever going to talk?? Introducing two languages at once typically does not cause a language delay. Some children will have a slight delay in either both languages or one more than the other, but this should resolve quickly. Is she using the 15-18 words in both languages or is she giving preference to one over the other? A speech evaluation is also what I would recommend but because your daughter just turned 2 and is exposed to two languages I wouldn’t worry too much yet. But it is definitely something to keep an eye on. The speech language pathologist that is doing the evaluation may recommend a home program to try for a few months. It is better to worry a bit and take action early than it is to take a wait and see approach and end up with a 4 year old that is barely talking. I commend your pediatrician on recommending an evaluation as many doctors tend to put parents minds at ease by telling them to just wait and see. Honestly, so many of her words are animal sounds but the words that are not animal sounds are in English. I will do the evaluation because I too agree that i would rather be overly cautious than not. One more question-do you count words that are baby talk and used exclusively and consistently to identify particular things? For example-my daughter refers to kids as “Gaga” and has for a very long time. Her pediatrician won’t count it but another doctor said too. Sounds like they are on extreme ends and would love a third middle ground opinion. Animal sounds and made up or “baby words” do count as words as long as they are only being used to refer to that specific object, person or animal. For example, if a child that says “moo” for all animals then it cannot be counted as a true word. If your daughter is only saying “gaga” to refer to children (and not people in general) then it is considered a word. Just like a child saying “baba” for bottle or “wawa” for water. Those are words. But if “baba” is used to refer to anything the child wants to eat or drink then it is not a word. Some of these tips were super helpful! One of my children have a speech delay and I used the assessment here https://bit.ly/2vBCC2w To help figure out that they had it. 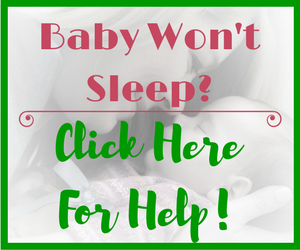 Hopefully this helps the other mommies that unsure as well! Thanks Jess! And thanks for sharing the assessment. I did not go through it so I can’t attest to it’s quality. Whether using an online assessment or not, if you feel your child’s speech and/or language skills are behind please have an assessment done by a registered speech-language pathologist who will guide you in the right direction! Loved the article! Do you have any specific tips/thoughts related to unintelligible speech? My almost 3 yr old talks a lot but much of his speech is still unintelligible to others. We are in the process of setting up an evaluation. Thanks! Some of the tips I shared in the article would be applicable in your situation. For example, be sure that you are speaking clearly and enunciating early sounds such as /p,b,m,n,h,w/ when talking to your son. Since you probably understand much of what he is saying (despite others not being able to), repeat back what he said slowly and clearly. But don’t ask him to repeat you. Make eye contact with him and try to have his attention before you begin speaking (I know this isn’t always possible, but try as much as you can). Good for you for setting up an evaluation. It is so much better to be proactive. I would also suggest setting up an appointment with an audiologist to have his hearing checked. Even a mild hearing loss (usually caused by fluid in the ear) can result in a child having difficulty producing sounds clearly. I hope this has helped and hopefully you won’t have to wait too long to see a speech therapist. Thanks so much for your comment. I am happy that you have found the article helpful. I enjoyed reading your article. I had speech delays when I was little. I always attributed it to the fact I was an only child and both of my parents worked full-time running a hobby store and I did not get a lot of one-on-one time with them. I spent a lot time in the backroom of the hobby shop playing with toys and since I was an only child, I did not interact much with others. It was a garden railroad hobby shop and my first word was “train” because those are the words I heard most often. Which brings me to my questions. I personally think environment has a lot to do with speech delays. I also think children who are born to a family of siblings will also have better chance of not developing speech delays because there will be other kids also talking to the toddler. Would love to hear your thoughts on that and how those factors affect speech delays. Thanks for your questions and sharing a bit about your childhood. Yes, the environment a child is raised in plays a very important role in a child’s development. This is why I am such a proponent for learning through play and experiential learning as opposed to focusing on early academic skills. However, I know several speech therapist’s whose children have speech delays. So it is not only a child’s environment that is important. But when a child is identified as having a delay of any kind it is important for the parents to do as much as they can at home. As for siblings, this can help a child, but there are many only children with no language development issues. The same goes with first born children. Many don’t have a sibling until they are 3 or 4 years old and well on their way with language development. I hope that I was able to answer your questions. Fascinating article! I definitely agree with Tip 15: Read, Read, Read. One of my fondest memories growing up was the time my parents spent reading to me. I make it a point to read to my children every day. They enjoy the time we spend together and the benefits will hopefully last them a lifetime. I sure enjoy the time we spend reading together as well. Thank you for sharing your knowledge about helping toddlers with their speech. Thanks for your comment. Reading and exposure to books is an essential part of a child’s development. As you have mentioned, it is also a great way for parents to spend some quality time with their children! I have a toddler at home and I’ve done the repeat after me bit, but now that I’ve read your article, I will not be doing that again. Also, my son has a very active imagination and prefers the TV to be off, and also doesn’t really like the talking toys and always tells me to turn them off. Very useful article and definitely gives the reader peace of mind if they are worried. Thanks Ian. I know many parents that ask their toddler to repeat what was said. Doing it here and there won’t cause any harm, but try not to make a habit of it. Your son sounds like my daughter. She can only handle so much “screen time”. After about an hour she wanders off to play. Now that she is 8 she has started writing her own short stories. They are very cute! She doesn’t like to read, but she loves to write. Go figure! My youngest son started to say his first words only at the age of 3. And both my wife and myself were worried because our eldest son was able to mouth his first words on his first year. How I wished this post was written then or someone had written such a informative article. Well done. Thanks for your comment. I am not sure how old your son is now, but hopefully he is doing well and that he has not had any issues as a result of being late to talk. Interesting, I didn’t know speech delay was such an issue with kids! I learned the alphabet and how to talk a little bit by the time I was 1 years old, so its pretty shocking to know some kids can’t learn words yet as a toddler. I guess if it’s an actual medical condition or something, it totally makes sense though! I wouldn’t say a speech delay in toddlers is a common issue, but it does happen. And for many toddlers there is no medical condition that can explain it. We all develop at different rates. However, as more and more research is done with babies and children and how they learn, we are learning a lot. We used to think that children should develop at their own pace (especially if there was no underlying condition) and it was quite normal for children to start speaking anywhere between 1 and 3 years old. Dr’s told parents not to worry when their two or three year old was not speaking. However, we are now finding out that about 20-30% of these children who were late to talk (but did eventually speak) struggle in school with reading and writing. Studies are also showing that early intervention (seeking treatment prior to the age of 3) does help these children and allows them to be successful despite being late to talk. Thanks William! Unfortunately child speech and language development is not a subject that most parents are very familiar with. Also not all doctors are aware of the speech and language milestones children should be meeting. This is why so many people often take a “wait and see” approach when it comes to their toddlers language development (or lack thereof). Many children who are late to talk will catch up on their own. But if you can help them catch up even faster, why not! As I have hoped to point out, learning language and all of its intricacies is a building block for future success later on! This is a great site with awesome information for anyone trying to raise a toddler and make sure they are engaging their brain. I myself am not a parent but once I become one I will definitely come back to this site for help to make sure I do the best I can when raising my child. Awesome post with great information. Thanks! I am happy to hear that you found the site helpful despite not having any children! This is a great article! #10 is something I would never have thought about but you make a great point. My 4 year old has a difficult time pronouncing a few letters. One being a hard “C”. It comes out more like a “T” sound. He’s only had some evaluation at his preschool but nothing more involved. Would you recommend speech intervention for something like that? Tip #10 seems to be the tip that surprises most parents. But really it is not that surprising. The majority of toys nowadays come with batteries. And it seems counterintuitive to remove the batteries when they are what makes a toy work a certain way. However, so much more learning and person to person interaction can occur when they toy isn’t doing all of the “talking”. Your son is doing something we in the speech world call “fronting”. It usually starts clearing up around the age of 4. Make sure that you are always repeating back the word with the correct pronunciation. But don’t ask him to repeat it. If he ends up getting speech therapy, the therapist will probably ask you to do some home practice with him. At this time it is ok to make corrections and expect that he tries to repeat you. But don’t do this if you are not working with a speech pathologist. There is no harm in having a speech and language assessment done for your son. The speech pathologist may recommend a home program if his mispronunciations are not that bad. Thanks for the info! I have a nephew that has been having speech problems since he was little. He is now 7 years old and is still having the same issues with his speech. I was unaware of how to help him with speaking and I have used some of your tips that you have provided but not all. I am going to have to make better eye contact and slow down. I tend to move to fast with him. Sorry to hear about your nephew! But it sounds like you are quite involved and trying to really help him. As I said, these tips are for toddlers, but they can be used for any age group. I am happy that you are going to try some of these tips out with your nephew. if you have any questions feel free to ask me! Hopefully I can help you out. Some great advice in this article, thank you!! You actually surprised me with tips number 6 and 10… but your reasoning behind them is actually quite logical! 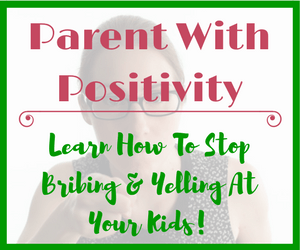 Yes, some of the tips may be surprising to some parents, but I hope my explanations behind them will help. If it weren’t for my background in Speech-Language Pathology, I would not know all of this information. It is great that you are following the “let your child lead” tip with your niece. You will both get some much more out of the interaction this way!